I recently discovered this company and thought their lunch boxes looked so cute. I loved the idea of being able to change the “face plates” and make the lunch box different each day. I also love their icepack and containers that fit their lunch boxes. I’ve never seen the product in real life but the company did send me some photos and info that I can post here for you all to read about. I encourage you to check them out. San Francisco, CA – April 30, 2010: As any parent knows, the lunch box is one of the most necessary, yet frustrating, accessories in a child’s life. Kids want to carry something cool and current, while moms want a lunch box that’s easy to use, easy to clean, and good for the environment. Sadly, the typical lunch box sold today is hardly unique, convenient or fun for kids. Instead, most have pedestrian designs, require endless use of plastic baggies, and become a smelly mess within a month. Finally, there is a better option: with yubo’s revolutionary redesign of the lunch box inside and out, packing lunch is fun again. The creators of yubo started with a simple concept: the lunch box should be cool, easy to clean, and help to prevent waste, not create it. Working with one of the top design firms in the country, along with a healthy dose of real-life experience as parents, founders Cyndi and Paul Pedrazzi created a lunch box that a child can personalize on the outside and parents can customize on the inside for packing the perfect lunch. Even better, yubo can go straight into the dishwasher anytime. The yubo lunch box is a reinvention from the ground up. At the core is a patent-pending modular design using BPA-free plastic treated with an anti-microbial agent, allowing for frequent, thorough dishwasher cleaning. Inside is a specially fitted ice pack and three food-safe, economical and reusable food containers, all designed for kid-friendly foods. Outside, kids create their own look by ordering custom tags and faceplates. 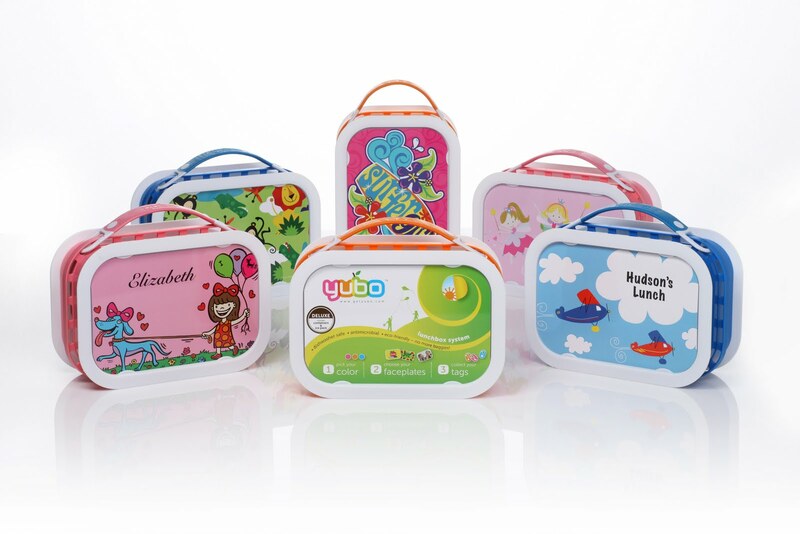 They can personalize their lunch box with yubo’s own designs, optionally add their name, or upload their own artwork or photos for a completely personal look. At just $6.95-$12.95 for a pack of two, the faceplates can be changed regularly, turning the lunch box into a creative canvas for kids to express themselves as they grow. The revolutionary yubo lunch box is available in three delicious colors – pink, blue, and orange – and can be customized with a wide array of faceplates to suite any taste. The standard lunchbox is $21.95, while the deluxe model includes three custom food containers and an ice pack for $29.95. *I was not compensated in any way for this post. I just did this for a because reason.